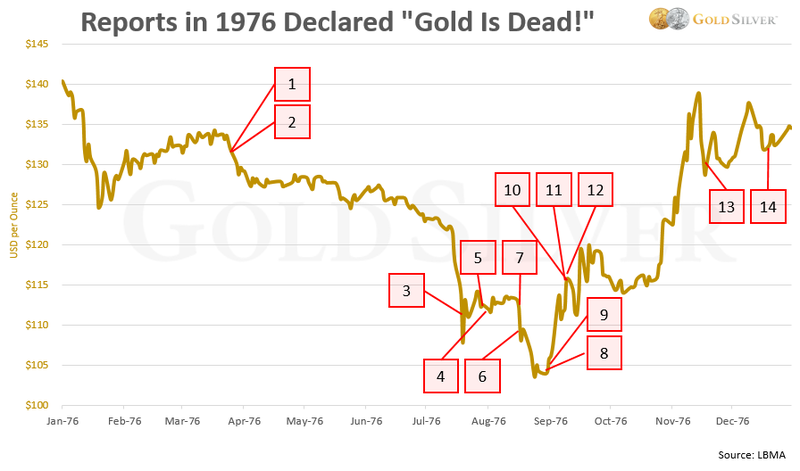 Gold is Dead—Just Like in 1976! Liberal economist Paul Krugman proclaimed earlier this year that “gold is dead.” An Economist article stated that “there is no point in investing in gold, any financial investment is better.” And Warren Buffett, one of the most successful investors of modern times, has never liked gold. So should we just give up on gold? Is it really a brave new world where modern finances have no need for a barbarous metal? I can understand how one might be tempted to think so, especially with the persistent weakness in price. There’s just one problem: we've seen this behavior in gold before—and it didn’t last. Gold’s biggest modern day bull market lasted the full decade of the 1970s. But in the middle of that run, the price fell relentlessly over a 20-month period. From December 30, 1974 to August 25, 1976, gold declined a whopping 47% (based on London PM fix prices). That had to be tough time for gold investors. The price was in a downward spiral for most of 1975—and then cratered even more in 1976. It just couldn’t seem to catch a break. The downtrend wore on and on, pushing many investors to give up. Most pundits declared gold dead. Sound familiar? As you’re about to see, there were plenty of negative commentators about gold then, too, all of whom found out not too long afterward just how horribly wrong they were. I spearheaded this research when I was at Casey Research. At the time I enlisted the help of two local librarians, along with my wife and son, to dig up some quotes on gold from 1976. The process wasn’t easy; publications weren't in digital form yet, so online searches yielded poor results or weren’t sourced properly. Our method uncovered some gems, however, which you’ll see are hauntingly familiar to what’s being said about gold today. The public statements listed below were all made in 1976. I put the comments into a price chart, pinpointing the date they were said relative to the price. You’ll also see I can’t resist making some snarky comments of my own. “For the moment at least, the party seems to be over.” New York Times, March 26. Dear New York Times: Parties never last long; fundamentals do. “Though happily out of the precious metal, Mr. Heim is no more bullish on the present state of the stock market than any of the unreconstructed gold bugs he's had so much fun twitting of late. He's urging his clients to put their money into Treasury bills.” New York Times, March 26. I bet a lot of Mr. Heim’s clients weren’t too happy with him when gold rose over six-fold by January 1980, while the US dollar – which underpins the value of Treasury bills – lost a whopping 26.2% of its purchasing power in the same period! “'It's a seller's market. No one is buying gold,' a dealer in Zurich said.” New York Times, July 20. Sounds familiar. But so what? To be a successful investor means to look at the horizon and invest for what’s likely coming, not what’s popular at the moment. “Though the price recovered to $111 by week's end, that is still a dismal figure for gold bugs, who not long ago were forecasting prices of $300 or more.” Time magazine, August 2. Turns out those $300 price forecasts by the gold bugs were too low. Gold would hit $850 in less than four years. “Meanwhile, the economic conditions that triggered the gold boom of 1973 through 1974, have largely disappeared. The dollar is steady, world inflation rates have come down, and the general panic set off by the oil crisis has abated. All those trends reduce the distrust of paper money that moves many speculators to put their funds in gold.” Time magazine, August 2. How short-sighted can you get? The symptoms may have abated, but the root causes were still present. Just like today. “Our own predictions are that gold will go below $100, with some hesitation possible at the $100 level.” As stated by Mr. Heim in the August 19 New York Times. Oops. Gold never fell below $100, so if you waited until it did you never got to buy, or paid a lot more. This is the same Mr. Heim as #2 above; I wonder how many clients he had left by 1980? “Currently, Mr. LaLoggia has this to say: ‘There is simply nothing in the economic picture today to cause a rush into gold. The technical damage caused by the decline is enormous and it cannot be erased quickly. Avoid gold and gold stocks.’” New York Times, August 19. You can see Mr. LaLoggia’s comments were made within days of the bottom! Investors should’ve done the exact opposite of what he recommended, and if they did they would’ve cleaned up. “'Gold was an inflation hedge in the early 1970s,' the Citibank letter says. ‘But money is now a gold-price hedge. '” New York Times, August 29. “Private American purchases of gold, once this was legalized at the end of 1974, never materialized on a large scale. If the gold bugs have indeed been routed, special responsibilities fall on the victorious dollar.” New York Times, August 29. Spit my coffee out and call me crazy… not only was gold on the cusp of setting records for demand, the “victorious” dollar has lost an incredible 77.3% of its purchasing power since this comment was made! “Some experts, with good records in gold trading, declare it is still too early to buy bullion.” New York Times, September 12. I guess they don’t understand the concept of contrarian investing. If instead of listening to the “experts” investors had bought gold, they would’ve watched their position rise 635% by January 1980. “Wall Street's biggest brokerage houses, after having scorned gold investments during the bargain days of the late 1960s and early 1970s, made a great display of arriving late at the party.” New York Times, September 12. Another example of investors arriving late to a bull market. Should we thank them now, that they’ll push prices higher and higher for us when they finally rush to buy gold in the future? “He believes the price of bullion is headed below $100 an ounce. 'Who wants to put money over there now? '” Lawrence Helmm New York Times, September 12. Gong. Not only did gold never fall below $100, but if you did “put your money there” you could’ve changed your life. Author Elliot Janeway, whose book jacket states, “Presidents listen to him,” was asked by a book reviewer about his preferred investments. He writes: “Then, gold and silver? He likes neither. In fact he writes: 'Any argument against putting your trust in gold, and backing it up with money, goes double for silver: silver is fool's gold. '” New York Times, November 21. Mr. Janeway ate his words big-time: from the date of his comments to silver's peak of $50 in January 1980, silver rose a whopping 1,055%. “Mr. Holt admits that 'in 1974, intense speculation caused the gold price to get too far ahead of itself. '” New York Times, December 19. This reminds me of Harry Dent’s belief, that gold is priced too high. But I’ve had that debate with him and won when he bet me. Does any of this sound familiar? All of these comments ended up being horribly wrong, with every single person eating crow. The reason gold resumed its rise—and ended up being the biggest bull market in modern history—is because the problems of the day hadn’t fully played out. They overlooked some rather obvious fundamentals that were staring them in the face. We have the same exact situation today: pundits poking fun at gold and claiming it’s dead, while we stare directly at an Everything Bubble, runaway debt levels, ongoing money printing by many nations, and the inability of most advanced economies to balance a budget a full decade after the financial crisis. The setup in gold is arguably better today than it was in 1976. Patience won in the end, my friends. History says it will again. Our current circumstances demand it. Mike Maloney and I and everyone else here at GoldSilver are convinced we are on the right track by owning a meaningful amount of bullion at this time in history. We continue to accumulate for what we believe will be a major shift back to precious metals in the not-too-distant future. Don’t listen to people who are unfamiliar with the gold market, or want to see their name in the headlines, or have a deep-seated belief that central bankers will save the day. “Buy gold. It's going a lot higher.” Jeff Clark, GoldSilver, November 26, 2018.